Undoubtedly one of the most annoying things when it comes to camping is setting up the tent. The less time you spend on it, the more time you get to enjoy your camping trip. 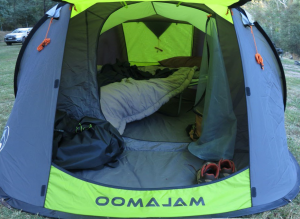 This brought about the rise of instant tents such as the ones by Coleman which I have reviewed before. The instant tents can be set up in around a minute once you get the hang of them and work well. However, you do need to practice a bit to get them to go up quickly. This is where the OzTent Malamoo tents come in. Not bad right? When it comes to setting up different tents, I’ve yet to see a faster set up. In my experience, the total assembly time, including the pegs is around 40 seconds not including the gazebo. However, just because it’s one of the fastest and easiest tents to set up doesn’t make it a necessarily great tent to actually use. To find out if it’s actually useful in the field and not just for show, I took it for a test. 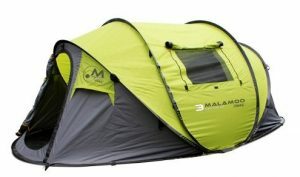 A 3 season tent, like the Malamoo, is a tent that is designed to be used in most normal and temperate conditions. They usually come with mesh panels for air flow. The benefit of the mesh panels is the fact that they repel bugs while still allowing air to come in. The 3 season tents have 3 primary functions: keep you dry if there is light snow or rain, shield you from any and all bugs and to give you privacy. Even in heavy rain, if the tent is well made and is waterproof enough it should be able to keep you and your belongings dry. Where 3 season tents fall short however are in conditions that include heavy snow, violent winds and harsh storms. If you are going to encounter moderate snow or fierce winds then you should look into 3-4 or 4 season tents instead. Peak height is important if you enjoy having a high ceiling or to have enough room to stretch. The tradeoff for increased height is weight and bulkiness of the tent. Vestibules are basically like mudrooms that are in front of a tent or somewhere on its sides. Their main benefit is that they give you extra space where you can stash your gear which can especially be helpful if the tent becomes crowded. You can also put your muddy gear there to keep the dry end of the tent clean. as you will have no room to move around at all if it’s at maximum capacity. Also while you’re sleeping, you’ll have no room to roll around. In most cases, if weight is not an issue, you usually would want a little more space as underestimating the tent space is better than overestimating it. Also, don’t forget that when using the dimensions of a tent to estimate the space that the vestibule sometimes takes up part of that space. I’ve covered the inner space area below, but some websites usually will not list that measurement. 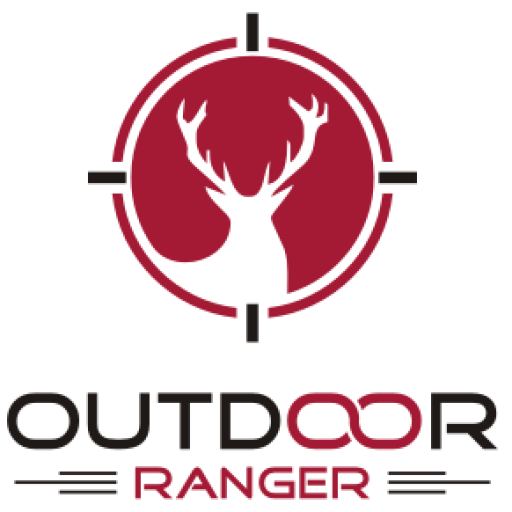 First and foremost, the materials and build quality are one of the most important things to look for in a good tent. You want something that’s lightweight yet strong. It also has to protect you from the elements and hold its ground in winds. The inner and outer layers in addition to the floor are all made from 65D 175T polyester. Polyester is good because it is light and it doesn’t stretch as easily as nylon which makes it UV and water-resistant. The inner lining is breathable and the outside layer is a weatherproof fly. The material is not too rugged but that makes it also pretty lightweight and in my testing, it held up pretty well against rain and wind. But more on that later. The frame itself is made from fiberglass. Fiberglass is great as it does not corrode or rot like aluminum. But it’s also not as strong as aluminum so it’s usually thicker to compensate which makes them slightly heavier in comparison. Build quality itself feels surprisingly solid considering it’s a popup tent. Once you open and set it up it can withstand heavy wind without any issues. This brings us to the weather resistance. This tent is rated as a 2-3 season tent. 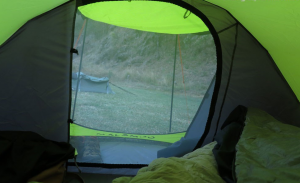 As mentioned before, this tent holds well in heavy winds. The waterproof ratings (hydrostatic head) on the fly and the floor are 3000mm and 2000mm, respectively. This makes it resistant to heavy rain so you don’t have much to worry about if a rainstorm is approaching and hold it true to its season rating. During my test, I encountered some rain and while it wasn’t heavy enough to test the tent fully, it kept me and all my stuff nice and dry without any issues. The 1 thing that I’ll mention however is that the awning doesn’t seem to have the same water repelling properties as the rest of the tent. If you are expecting some dew I recommend keeping the awning down as otherwise, you might get your backside wet when trying to exit the tent. 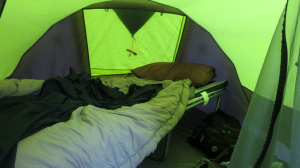 Starting off with the weight, the tent is pretty light with its total weight of around 13 lb. Regarding its size, the Xtra is designed to fit 2-3 people although I’d recommend you stick to 2. The interior is large enou gh to fit a queen-sized mattress although it will be pretty snug and space for bags will be limited. Alternatively, you can fit in a double sized mattress with plenty of room for bags or 2 sleeping pads. The exact dimensions of this tent are 9’10” (l) x 6’6″ (w) x 4’1″ (h). The height is enough to comfortably go inside and grab something or to just sit down but don’t expect to stand up to stretch in it. Finally, when packed up, this tent collapses into a circle with a diameter of 3’3” and a depth of 2”. Then consider the Malamoo Mega instead. The Mega has all the good features of the Xtra but is just bigger if you want more space or are going with more than 2 people. It measures in at 11’11″(l) x 8’2″(w) x 4’11″(h) and weighs around 17 lb. Not enough room to quite stand in but you have much more freedom. When folded up, the tent is a disk that measures 3’7”, just slightly bigger than the Xtra. You can comfortably fit in a queen sized bed and some bags around you as well. And similarly to the Xtra, the Malamoo Mega also comes with an awning variant as well but which are harder to find as opposed to the no awning version. However, unfortunately, also like the Xtra, you can’t zip up the entrance to the vestibule. The other final difference between the Mega and Xtra is the fact that Mega has side windows as well. So if you’re a fan of the Xtra and are going camping with 3 people or want more room to move around in, the Mega is a good choice for you. Now back to the Xtra; as with all things, there are some things that can use some improvements, and while the Malamoo nails most things down, there are a couple of small quirks that I have with it. As mentioned before, the awning collects dew which can get annoying. You also can’t zip up the vestibule entrance door which makes it flap in the wind. The fabric is not that thick but as a result of that it doesn’t cut out the morning light that well. Finally, the folded diameter is a little larger than I’d have wanted, but considering its weight and ease of setting it up, it’s not too big of a deal. 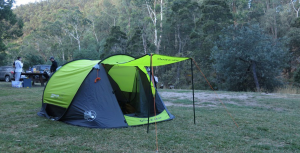 Is the Malamoo Xtra the easiest tent to set up? Debatably so. 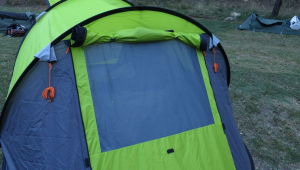 But does it hold up against other similar tents and is it worth the price tag? In my opinion, yes, but your opinions will vary. As always, check the sizes and features of a tent in detail to make sure it will work well for you and will fit you right.